Can you use the Cyclic Ketogenic Diet (CKD) as a way to gain a substantial amount of muscle mass while keeping body fat accumulation to a minimum? Learn how here! In my last article I presented the scientific research pertaining to the metabolic state of ketosis. While in the state of ketosis we come to realize that it is the optimal metabolic state to activate the breakdown of dietary/stored fat. This is one of the greatest benefits of dieting while using the ketogenic dieting route. Now we know that ketosis presents a highly anti-catabolic environment even while on a reduced calorie diet. So now the question on everybody's mind is, "Can you use the Cyclic Ketogenic Diet (CKD) as a way to gain a substantial amount of muscle mass while keeping body fat accumulation to a minimum?" The main complaints about ketogenic diets are that they tend to leave you with low energy levels during strenuous workouts, and because of the absence of carbs, the diet can be hard to stick to for long periods of time. If you find yourself agreeing with these reasons, the CKD may be a better option for you. Just keep in mind that it takes approximately three weeks to become keto-adapted, and introducing carbs during this time will make it almost impossible to be in a true ketogenic state. I personally find the CKD to work great for me, especially when bulking. I'm able to put on mass and still have energy in the gym for all my big lifts. The most important aspect of using the CKD as a means of bulking is to set your calorie level around 20 percent (25 times your body weight) over your normal daily calorie level. On a similar note, if this causes your calorie level to be too low/high you can always adjust it to fit your individual needs. The best way to consume the copious amounts of calories needed while bulking is to eat a high amount of steak, chicken, fish, whole eggs, sausage, bacon, and protein and oil shakes. The best way to set this up is to adhere to the "ketogenic ratio," which is somewhere around 1.5 grams of fat for every gram of protein. Your meal planning should consist of anywhere around 5-10 meals a day—that's right, I said 10. This is to constantly keep your muscle cells saturated with the optimal nutrients for growth. The best way to consume the copious amounts of calories needed while bulking is to eat a high amount of steak, chicken, fish, whole eggs, sausage, bacon, and protein and oil shakes. The most substantial difference with using the ketogenic diet for bulking as opposed to cutting is the carbohydrates. During the bulking phase I recommend a 36-hour carb load. This is to allow a substantial influx of carbs into the muscle but not to overdo it. The next major difference is that you are to have 1000 calories' worth of carbs, with a good amount of whey protein, approximately two hours before your Wednesday workout. The main goal of this carb spike is to allow you to have a substantial amount of muscle glycogen to maintain workout intensity. Now as far as the carb-up goes, one option is to start with very high-glycemic carbs, then taper down to lower-glycemic carbs. The other route is to eat what you want. For a hard-core bulking routine this is what most people will do. If you are going to follow the "eat whatever you can get your hands on" route, definitely try to choose the lower-fat route. This means if you are going to get doughnuts, try to find the brand that's lower in fat. But if you know you can drop the fat off at a relatively fast pace, then go ahead and get Nesquik and Krispy Kreme and have a fun time! Since you will be carb-loading Friday night into Sunday morning, you most definitely want to hit most of your body on Sunday when your muscle glycogen is overstocked. This is the main reason for the carb-up (bulking or dieting). The next weight workout will be performed on Wednesday, and I advocate a 1000-calorie influx of carbohydrates (preferably simple) before that. The rationale backing this up is that by Wednesday your muscle glycogen should be fairly low, and this influx of carbs will restock your glycogen stores substantially and allow you to perform at an optimal level in the gym. The next weight workout will be performed on Friday night before the carb-up. 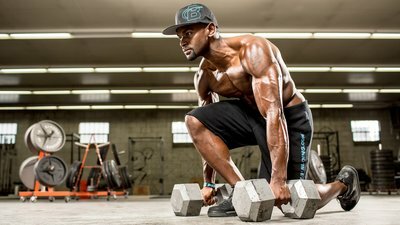 On this workout you should be performing a heavy full-body workout, mainly to fully deplete glycogen stores and causes an anabolic stimulus when you start exploding carbs into your muscles. I will not be going into the workout schedule in detail, because people respond very differently to various workout routines. The main advice regarding working out is to hit half of the body Sunday when your carb stores are very full, hit the other half of the body on Wednesday after your carb-spike, and then hit the full body Friday (1-2 sets to failure) before the grand carb-up. Another key point of advice is to stress exercises such as, squats, lunges, deadlifts, barbell rows, bench presses, military presses, barbell/dumbbell curls, triceps push-downs, close benches, and reverse curls. These are undoubtedly some of the best mass builders around and should be the core of your workout schedule. I highly recommend using different intensity techniques with these exercises. For example, have you ever tried doing a triple dropset with rack deadlifts? I'm talking about incorporating rest-pause and triple drops with compound movements. In another article I'll describe some death-defying workouts. As far as sets and reps are concerned, I highly advocate 1-2 very intense sets per exercise, around 3-4 exercises per body part (more for bigger muscles and less for smaller muscles). As far as reps go, I think anywhere between 4-10. When I go as low as 4 reps they are usually performed very, very slow with a five-second pause at the peak contraction. They are also usually the first very heavy set in a 3-set drop. Another key point of advice is to stress exercises such as, squats, lunges, dead lifts, barbell rows, bench press, military press, barbell/dumbbell curls, triceps pushdowns, close bench, and reverse curls. As far as time in the gym goes, keep it to a minimum. Too many people like to turn their workouts into a social hour. Just hit your muscles as hard as you can and get the hell out of there! Also, I highly recommend that you keep cardio to a minimum, although I do recommend 10-minute warm-ups and cool-downs before the workouts. But aerobics can greatly hinder your workout intensity, so keep them to a bare minimum. Plus, they will not allow you to get the most out of your bulking phase, muscle-wise. As far as the supplements go, I advocate essential vitamins such as C, A, E, and a high-quality multivitamin. But the best supplements I will be discussing are glucose-disposal agents. These will allow you to hit ketosis faster, and also allow you to cram even more glucose into your muscles during carb-load periods. This would be used like the other glucose-disposal dosage schedule. 200 milligrams would be taken Wednesday. The next best supplement to use is a combination of creatine monohydrate and glutamine. These should be taken in high amounts only during the carb-up, to further increase cellular hydration. About 10 grams of creatine should be taken around during your carb-up, and about 20 grams of glutamine should be taken along with the creatine. On low-carb days, stick with 5 grams of creatine and 10 grams of glutamine. If glutamine is not in your budget, then definitely use creatine. Many people prefer to use the creatine with a sugar base. That option will also work very well during carb-ups. On a further note, if you are going to be stuffing your face with doughnuts during the carb-up, I highly recommend you take 1 gram of HCA 30 minutes before meals. This is so you don't go overboard with your eating, and it also helps push glucose into the muscles and not the fat cells. Learn all about the keto diet and anything else about training!